The use of natural stone in bathrooms is taking over the nation, with more homeowners opting for this beautiful variation of tiling rather than a monotone cookie-cutter white tile that most have used in the past. But how on earth should you use natural stone to get the greatest cosmetic effect? Island stone is growing in popularity, mostly because of its unique texture which customers love instead of the almost hospital-like white tiling that has been common in the past. The beautiful rough surface of island stone is in perfect contrast to most bathtubs and sinks, making it the ideal choice. This example shows correctly the variation that you can expect in island stone, with some tiles almost a light mustard color while others are gray speckled with black and white. For most bathrooms island stone makes the perfect backsplash for a shower, as seen in this example, but it’s best avoided in large quantities. The rough texture makes it impractical for a flooring, while across the entire wall it would likely look excessive and cheap. But when used sparingly in this example it makes the shower look inviting and expensive, exactly what you want if you’re planning to sell your house at some point in the future. When people think of natural stone, neutral floor tiling often comes to mind. 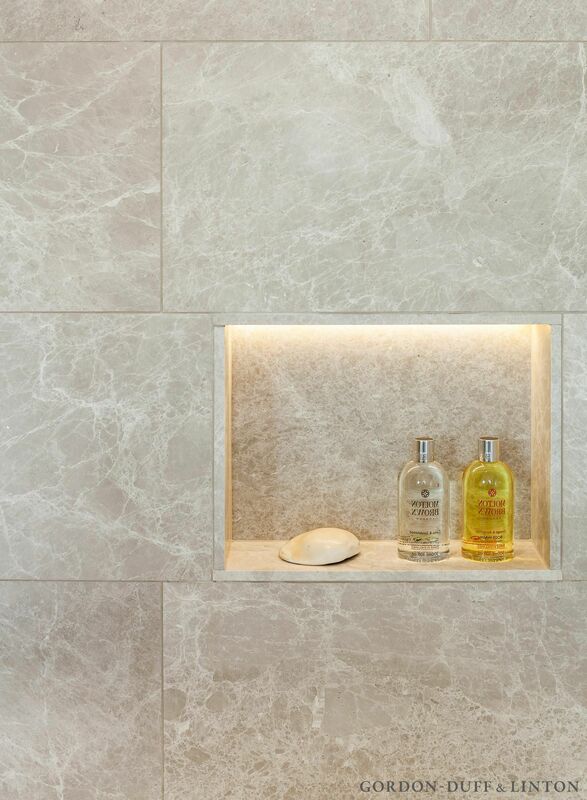 Perhaps as a revolt against the dull and boring white of most 20th century bathrooms, natural stone has become incredibly popular as a material for floor tiling. What most love about it is the natural variation between tiles which prevents your bathroom from looking like a cookie-cutter showroom, giving it some individuality and class. Natural stone comes in a variety of colors, but this neutral or beige color is particularly common for a home remodeling company or homeowner and is relatively inexpensive. Each tile can vary significantly from a yellow through to a light brown that you might find on some eggs. But it’s this variation which makes this example so beautiful, especially given that there is no pattern. For those who are resistant to gray and black in their bathroom, understandably, it can make it dark and dingy, a beige color is a fantastic option. On a practical level it’s easy to spot dirt on these tiles, but cosmetically this shade matches perfectly with the white of most toilets and bathtubs. Quartzite is a popular choice, perhaps more than any other natural stone, because of the slight sparkle that the rock contains. This sparkle is perfect for a bathroom, after all, every bathroom cleaning advertisement in history shows cleanliness with a slight sparkle and a smooth surface. Plus, this natural stone isn’t as expensive as some others which can make it the perfect choice for those who are looking to reduce the cost of their construction project. In most cases, quartzite works best as a backsplash or as a surround for a bathtub. It doesn’t look great as large floor or wall tiling because the sparkling can be excessive. Instead, used sparingly quartzite can add a little ‘wow’ to your bathroom, making it more enjoyable and pleasurable for you and your family. Natural stone doesn’t need to look rough and ready, although that’s often what people love about it, in this example each tile has been perfectly shaped to create a traditional pattern. Rather than having a cheap plastic soap carrier in your beautiful new bathroom, why not carefully construct a shelf into the wall for your shower products. In this example, they have also used waterproof LED lightings in the top of the shelf which creates a small glow onto the ledge. When you are showering at night or with a partner, this lighting can be romantic, especially if you chose LED’s that were color changing. Natural stone is sometimes archaic, but this example shows how you can bring this beautiful material into a modern design and create something truly breathtaking. Perhaps one of the most amazing examples of natural stone in bathrooms is this combination of natural stone walling, a mosaic tiling on the backsplash of the shower and grayscale mosaic flooring. What’s most appealing about this bathroom, in particular, is the colors, all of which are between gray and black but by combining them and clashing them against the white units and toilet they look even more luxurious. Natural stone in bathrooms is beautiful even in the worst examples, but when it is as elegant as it is in this case, it can make even the most experienced designer’s jaw drop. 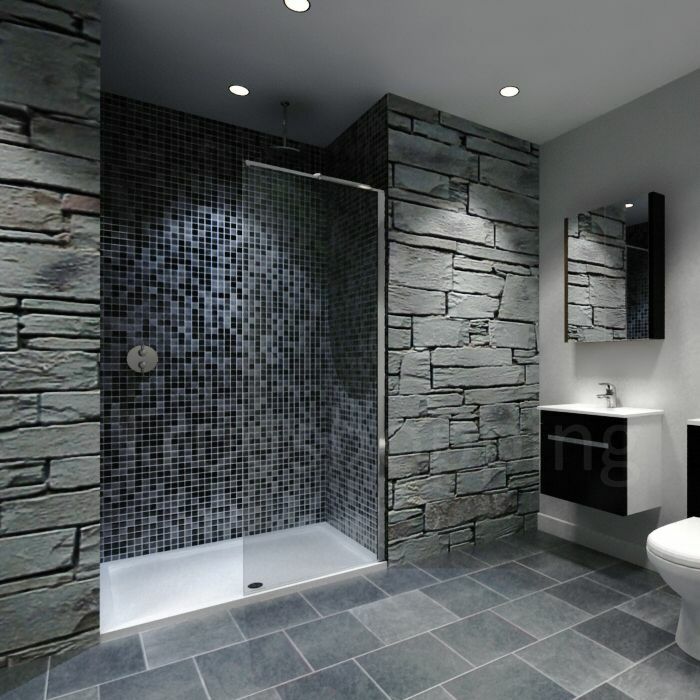 What is most appealing is the rough rock walling to either side of the shower which is in direct contrast to the smooth tiling of the floor. This rough walling is designed to look like sheets of shale, and you can see the natural cracking and shaping of the rock. Rather than fighting against this and try to make each stone the same size they have beautifully matched them together in a mosaic style by using black cement that doesn’t stand out against the gray of the rock. While this example wouldn’t be cheap to recreate in your home, it could easily inspire you to create a more affordable version which could be more realistic for your budget. Most notably the floor tiling is in a peculiar pattern rather than the standard alternating pattern, which catches your eye and arguably makes it even more unique and spectacular.